The Lectrosonics UCR411 is a portable, camera mountable receiver designed for professional audio applications in the field or indoors. 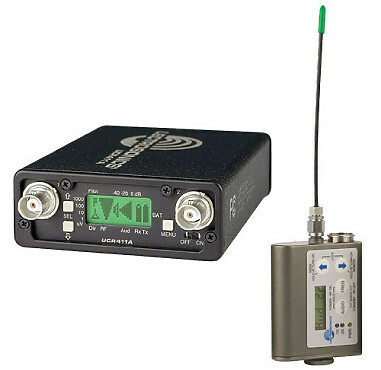 The receiver is completely compatible with all 400 series wireless transmitters and provides 256 selectable UHF frequencies across a 25.6MHz tuning range. Smart Diversity reception reduces RF interference and dropout and a built-in RF spectrum analyzer searches across the entire 25.6MHz tuning range, locating the strongest possible frequencies in the area. The clear frequencies are marked and displayed on the back-lit LCD. Balanced XLR output provides maximum output gain with minimal noise and the receiver is powered with internal 9V batteries or an external DC power supply. The UCR411 uses Lectrosonic's Smart Diversity design for even further protection against RF interference and signal drop out.